Chris Priestley is a musician who has been pivotal in the Auckland folk music scene for over three decades. He is equally a business entrepreneur and culture creator. One of the founders of Real Groovy Records, he moved on to start such iconic music cafes as Java Jive and Ponsonby’s Atomic Café, which became important musical hubs for aspiring singer/songwriters. Priestley is still an active musician and recording artist. His 2013 album ‘Unsung Heroes (Songs and Stories from New Zealand’s Distant Past)’ and recently released album ’Rogue’ are well-researched themes exploring our country’s folk music heritage as well as songs written about some of New Zealand’s most colourful historical characters. 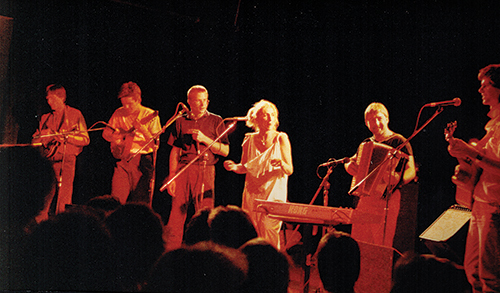 Pictured left to right: Andrew Dixon, Warren Sly, Robbie Laven, Phil Powers, Andrew White, Chris Priestley, Angela Fox, Cath Woodman, and Kerrin Worsfold. When and where this photo was taken? What was the occasion? It was at The Bunker (Devonport’s folk music club) in 1994 for the release concert of my first solo album, ’Argentina to Invercargill’. The place was packed, and the post concert jamming went on into the night, until the Jamesons ran out. As a child did you suspect that music was going to be a career in one form or another? My parents always played classical music around the house (LPs and the radio), Mozart being a particular favourite. They also made me take piano lessons, which unfortunately I stopped when given the choice, and took up golf. Still, at age 8 was a Beatle fanatic. When the Beatles came to Auckland in 1964 my uncle (who was from Liverpool) was working on the Town Hall renovations and managed to meet them and got them all to sign a program ‘To Christopher’. It was my most prized possession for many years until I left home and discovered Led Zeppelin and the Stones, leaving the autographed program at my parents’ where it disappeared or was eaten by silverfish. I searched for it many times in my later years but to no avail. As a teenager I was lucky to see many great concerts. The Stones and Led Zep at Western Springs, Jethro Tull and Osibisa at the Civic, Deep Purple and many others who came out during the ‘70s. Concerts seemed to be a lot more affordable back then. Also happening at the time were the Radio Hauraki Buck a Head concerts at His Majesty’s Theatre (a beautiful theatre demolished by the Chase Corporation illegally in the middle of the night). I saw great NZ bands from Split Enz to Ragnarok and the Red Hot Peppers, but my favourite was Waves with their acoustic guitars and great harmonies and my conversion from rock fan to folkie began. I also went to the Nambassa festivals and hung out at the Aerial Railway stage, which was a smaller venue for acoustic acts. I saw and loved John Martyn, also Kiwis Chapman and White, and Chris Thompson, making me realise there was some fantastic NZ contemporary folk happening, which inspired me to start playing guitar. Does Aotearoa have a rich folk heritage? Possibly the first folk song in NZ was about Davy Lowston and his band of sealers marooned on the Open Bay Islands (now Jackson Bay) in 1810, and there were many songs written and passed on since then about whalers, gold miners, swaggies and others. Many are found in early books like Shanties By The Way and NZ Folksongs, Song of a Young Country by Neil Colquhoun, and on the recordings of folk historians like Phil Garland and Mike Harding. Folk festivals have been happening for more than 50 years, with the largest in Auckland at the Kumeu Showgrounds. My favourite is the Tahora folk festival on a farm on the Forgotten World Highway in Taranaki, which I have been attending for more than 30 years. In the early days we would go for a couple of weeks just playing music into the night around campfires and in the shearers’ quarters, learning and sharing songs, only stopping for a blackboard concert or the annual gumboot toss. Were there early indicators that pointed to your musical aspirations and entrepreneurial abilities? I started hanging out at the Poles Apart Folk Club where the toasted sandwiches were awful and the coffee (which came out of a large urn that had been stewing for hours) was worse, however the music was great, with a concert night every weekend for invited guests and an open night on Wednesdays for beginners like myself. It was run by Frank Winter who was very encouraging to us new folkies and this was one of the few places where you could go and perform. Today where there are open mics every day of the week all over town. There was a backroom where all the cool bluesmen hung out and played amazing blues. Glenn Crosse was my favourite and he was also the toymaker at the legendary Cook St. Market. I knew that one day I would try and create a place with great music and decent food and coffee. Was establishing Real Groovy Records your point of entry into the music business? I had been collecting a lot of vinyl – folk, blues, country and more and more jazz. It was my John Coltrane habit that connected me with Chris Hart, who at the time owned the Record Exchange in K. Rd. I started working for him on Thursday nights to pay my tab and we became friends. He sold the Record Exchange and for a while we cleaned old bricks together to make some extra money and eventually decided to put our record collections together and start another shop, which initially had records, valve radios, second hand books and musical instruments. We called it Notoriety and it was where the Mamata Bakery is now in Westmere. I used to sit out the front with my dog Hendrix and strip the old varnish off the valve radios and man did they look beautiful restored. Unfortunately FM came in and they became obsolete. Chris hated the name and when we moved to Mt Eden Rd we changed it to Real Groovy Records. We bought a 1966 Mercedes stationwagon (ex-hearse) and started advertising for LPs etc. We moved to Queen St and even commissioned Chris Knox to animate an advert for TV which we could only afford to play late at night during The Young Ones. When I left I still had a large record collection but much more wide ranging in styles, quite a few old radios, a good knowledge and love of all sorts of music and many musical contacts and friends. And what saw you enter the folk scene and forming Acoustic Confusion? I was asked to be part of one of the annual University Folk Club concerts at the Maidment Theatre and after hearing Julian McKean and Denny Stanway harmonising together I asked them to join me on a couple of Crosby Stills’ numbers. We thought it sounded pretty damn good so we decided to form a band with my flatmate Brendon Power joining us to add his amazing harmonica skills. Julian started writing some great songs and we also covered songs of friends. With the help of Real Groovy we made an LP called ’Hazy Days’, partly paid for by pre-selling which raised $1500 – enough for all the recording costs in those days. This was RGR 001. 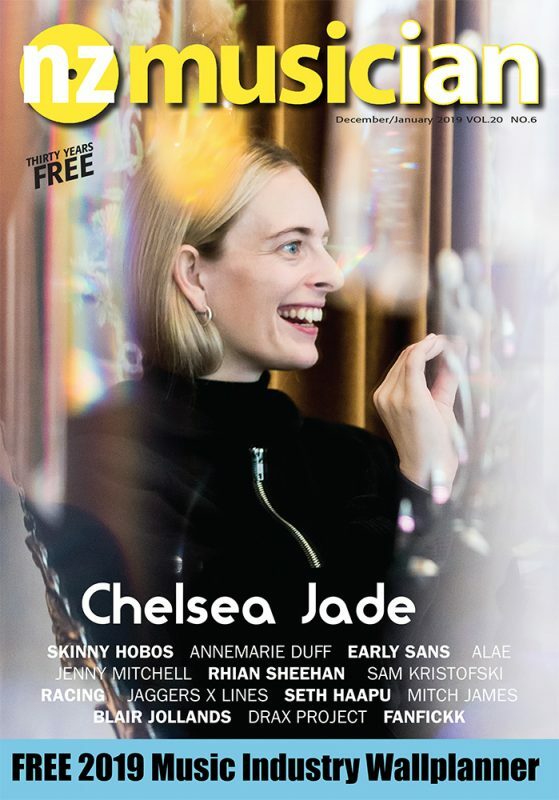 We were invited to play at Auckland, Wellington and Dunedin folk festivals and were part of a new movement of contemporary songwriters performing original NZ songs. I then organised a compilation LP called ’Auckland Acoustics’ which showcased a lot of our fellow Auckland songwriters including Mahinarangi Tocker, Wayne Gillespie, Chris Thompson, Kath Tait and more. We raised the money by doing a concert at the Freemans Bay Community Hall, which was packed, and then did another concert when the LP was finished. What were the primary factors you learned from running a music business back then? Before the internet came along LPs and concerts were the only way of hearing acoustic music and even jazz (nothing on the radio) so the record shop was a bit of a meeting place and lots of friends were made. Face-to-face Facebook. Later my cafes were also styled as being a place to meet and always hear great music. What was the reason left Real Groovy and how did you replace it? Chris [Hart] wanted to buy a large neon sign and mortgage both our houses, which I wasn’t keen to do. So we agreed to go our separate ways and tossed a coin to see who bought whom out. When I left Real Groovy (late 1985) I had a large collection of LPs and also 45s and decided to go back to the dream of creating a musical cafe. The first Java Jive was created in an old butchers’ shop on College Hill, initially with two juke-boxes (one which only played 78rpm records including Charlie Parker, Bessie Smith and Muddy Waters). The name of the cafe was from an old Ink Spots’ song and when they came to town (including one original member) they heard about the cafe and came and did a fabulous lunchtime concert. Also playing at the Gluepot across the road were great bluesmen such as Brownie McGhee and Champion Jack Dupree, both of whom heard we had their 45s on our jukebox and came down to check it out. Champion Jack (once the flyweight champion of the world and a great boogie woogie pianist) asked for a Coke and a toasted sandwich, neither of which we had, so I sent our dishwasher out the back door to the takeaways and he was happy, and even played a tune on our piano. We had Sunday folk concerts which helped draw a big crowd to our little cafe and eventually we had to move to a much bigger cafe to fit everyone in. After a while the late nights became a grind, so we sold the cafe to Beaver, Paul Walker and friends who turned it into more of a rock blues venue which also worked well. Do you think your venues Java Jive and Atomic (121) have contributed to creating a musical hub for acoustic music in Auckland? The Java Jive became a bit of a hub for musicians with Mahina Tocker working as a dishwasher to take another great songwriter, Kath Tait‘s place, as she had become a cook. When Mahina left Kath asked if she could be demoted to dishwasher so she could spend more time thinking about songs. We also had members of the Headless Chickens and other rock musicians working as there was never enough money from music alone. After selling the Java, I started the Atomic café/roasters but I was missing the musical gatherings. At the time most cafes had DJs (if any music at all), so I invited some of my friends to come and sit around and make music every Thursday night, while still being open to the public. Because of the high quality of music being heard by people who wouldn’t usually go to a folk club, more and more people started coming and appreciating acoustic music. We also started a Wednesday night open mic night and when someone amazing turned up I would invite them to come back to the Thursday gathering where they would meet lots of other top musos and play to a crowded cafe. How do you juggle business imperatives with your creative aspirations? In all the years I owned and ran cafes I collected and performed mainly NZ songs, but never had time to write songs. There was always an excuse not to as I always had a cafe or business to put my inspiration into. It wasn’t until I moved to Dunedin and had no cafes to run that I finally put my mind to it and started writing songs. I’ve heard you described as having a light but firm curatorial role in the presentation of entertainment you put on at your venues. What makes for the ideal entertainer in a café situation? Because of the amazing musos that turned up to play I enjoyed combining talents to help create more magic. I would always check with the artist performing first but would suggest they might like a little fiddle or harp or some harmonies perhaps. Sometimes halfway through a song someone would walk in the door and thinking they could add something special I would quickly set up another microphone. By introducing musicians to each other many a great band has been formed at Atomic/121, including the Beyondsemble who went on to play at the World of Wearable Arts and overseas. Though I knew most of the performers over the years, occasionally someone I didn’t know would ask to play and usually I suggested they come and have a listen first, which inspired a lot of newer musicians to go home practice a whole lot before asking again. With an overseas traveller, I would suggest they do two songs only, then if they were fantastic the crowd would cheer and they would get to do a couple more. The musical highlights over the years have been many but I do remember one night Linn Lorkin was about to sing Autumn Leaves (an old jazz standard) and Whirimako Black was in the house so I suggested a duet. Then Caitlin Smith walked in, so I put them together and we had English, French and Maori verses with Lance Sua and Nigel Gavin on guitars and great scatting to finish. Ponsonby was clearly quite a musical neighbourhood before it became gentrified. The Gluepot was a great venue with bands in the Corner Bar such as Neon Quaver, Truda Chadwick and many more. Upstairs was a rock venue but I also remember seeing Townes van Zandt, Lucinda Williams, John Prine and other fantastic country stars brought out by Real Groovy (after I had moved on). In folk music, like jazz, it can take a while to find one’s own voice as a singer and songwriter. Is there a sense of needing to join the dots of the past to find one’s individual voice? Yes. I joined the dots as a singer for 30 years before becoming a songwriter, but I suggest that’s a little too long. But I did enjoy interpreting other friends’ songs on some of my earlier CDs. They would come and sing a harmony or duet on their own songs. On one occasion where I had recorded a lovely song by Mark Laurent (a very gifted songwriter/singer/guitarist) and I had adapted it to a dadgad tuning. Mark later re-recorded the song doing his version of my version. Some of your first attempts at songwriting were for a children’s album. Is it a different process and do you road test the material to check its suitability? I had learned songs to sing to my children many years ago and when my wife Felicity’s grandchild arrived, I started re-learning them and decided it would be nice to make a CD of childrens songs which was more folky and not so over the top. A CD that parents actually might enjoy as well. I also decided to write a couple of songs for it, which was a good first step as a songwriter. What’s been the creative process with recording your solo material? After many late night sessions sitting around campfires jamming at folk festivals I decided to record my first solo LP, although it wasn’t solo at all, but rather a collection of friends helping me. I had met Robbie Laven and admired his playing and asked him to help on the ’Argentina to Invercargill’ LP. He co-produced and played many different instruments from bouzouki to gambung, plus harmonies from Angela Fox who also sings on my latest CD, some 20 years later. The folk community has always helped each other and hardly a dollar changes hands. Most artists pay for everything themselves and very seldom do they make their money back. Crowd funding these days is a great help if you have a following or an interesting project. ‘Unsung Heroes’ and ‘Rogue’ are great records and you obviously have a folk musician’s ear for our local history. How do you research the material? I started with a song about Darling Jennie the magician after watching my wife Felicity dancing in a show loosely based on Jennie’s life traveling around NZ in the 1860s. I wondered why I hadn’t heard of her and how many other colourful characters might have been around. I discovered the website papers past, a digital collection of NZ newspapers between 1839 and 1948, free and online, and also visited libraries, museums and second hand bookshops in my hunt for more interesting unsung heroes, rogues and rebels, with the idea of writing songs about them so more people could learn about our rich history. Having grown up and gone to school in NZ I learned very little about our early history and knew much more about General Custer and Ned Kelly than Von Tempsky, or our own highwayman Robert Wallath from New Plymouth. For my ’Unsung Heroes’ CD I decided to finish with a song about my dad’s war story, which I only heard about not long before he died. Like many soldiers he was reluctant to talk about it. The song was based on the three telegrams I found addressed to my nana from the Prime Minister’s office. The first stating ’…your son is missing in action’, the second a year later saying he was injured and a prisoner of war, and the third (another year later), saying he had escaped and was on a plane headed for England. After hearing the whole story of his war years I can only imagine my nana’s emotions and though I spent many hours as a child sitting on my nana’s verandah playing Scrabble and chatting, the war was never talked about. My dad never talked about it until not long before he died when, fortunately he wrote it all down for me, which helped explain why he liked to spend hours on his own peacefully carving birds. He also loved watching old westerns where the heroes never die. Many songs over the decades have been written about NZ’s past but usually in a much older traditional style and I thought it would be useful to take a more contemporary approach and having been experimenting with different capos (shortened and using the tuning dadgad) together and in different places, I was able to get some unusual voicings for my fingerpicking style. Add to that Nigel Gavin and his 7-string Laurie Williams’ handcrafted guitar, played like only Nigel can, the songs end up with a sound of their own. I had been a bit reluctant to sing songs with Kiwi names in my earlier years, as it evoked memories of Taumaranui on the Main Trunk Line and Tea in Te Kuiti and I was trying to be a modern folkie. Luckily I got older and wiser and realised it is important and fun to add NZ place names. How have you seen the local folk genre change over the decades? The folk genre hasn’t really changed and is still generally acoustic (though not always) and still tells stories rather than just being something to dance to. Though the word folk has at times had a negative image, which was why we called our LP ’Auckland Acoustics’ back in the ‘80s, I think today it has become hip again. As for what makes a good singer/songwriter, getting and keeping the audiences attention is most important. You’ve worked with established artists like Nigel Gavin and many others. What sort of creative chemistry do you encounter in these sorts of collaborations? I particularly love being in the studio with a great sound engineers like Olly from The Lab or my great friend Robbie Duncan from Braeburn. I like to put my guitar down first, then, with a nice single malt and dim lights, add my vocals. Then adding Nigel’s guitar sometimes overlaying 3 or 4 styles. With one song on the ‘Rogue’ CD I sent my track to Brendan Power in England where he added harmonica, while back here Jess Hindin added her amazing fiddle – without hearing each other. The result was magical, but then they are a couple of geniuses. The harmonies were then added by Cameron Bennett (not just a talented journalist) and Angela Fox, an old friend and songwriter from the Acoustic Confusion days. 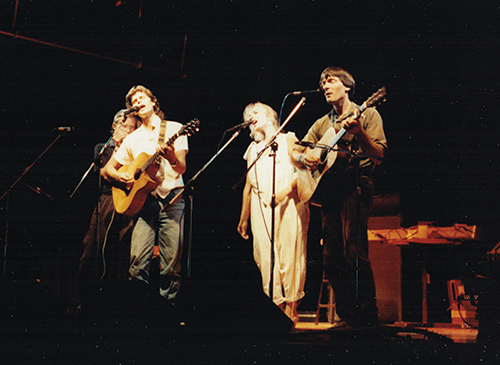 Julian Mckean added his harmonies from a studio in Palmerston North without ever singing with the others. I will look forward to the day when we can all be together in the same place to perform them live. Most of them, with others, will be helping me as a guest at the Auckland folk festival next Waitangi weekend. How does the writing process work for you? Do you treat it as a discipline? I have an old cassette recorder, which I have been recording riffs and tunes on for years. When I have a character for a new song I have a listen back to find a tune or groove that fits or feels right, then I start writing lyrics, sometimes completely changing to a different tune after the lyrics are finished, until I’m happy. Then I leave it for a while and go back and listen with fresh ears. When I was getting started as a songwriter, I visited Arthur Baysting who helped a lot and co-wrote some of the songs. I also visited Linn Lorkin to co-write when I felt I needed a more colorful swashbuckling feel as in Hokonui Moonshine Whiskey Blues and Von Tempsky. Are you now a collector of folk instruments and recordings? Yes, I am a crazy collector. LPs (I still have my first, ‘Help’ by the Beatles, bought new in 1964 but now nearly eaten away by silverfish and completely unplayable); posters (Jan Grefstad from the Classic Cinema used to come in to Real Groovy to collect 78s and swap for old posters he had stored above his theatre); old microphones; books on music; books on history and quite a few instruments. My two guitars are both NZ-made, one by Peter Madill of Dunedin and one by Peter Stephen of Christchurch. I did thin out quite a lot when we moved to Dunedin and back but still have a large garage music-room man-cave. I have been lucky to combine my love of music, coffee and meeting people and make a living at the same time. Many people spend most of their life working at a job that they hate which I have always managed to avoid. Even now I am an employee at Corellis, a lovely cafe in Devonport where I am able to play my own music, organise concerts and still have time to write songs and record. Who would you consider made the biggest impression on you and why? It is the NZ songwriters who have inspired me the most. Paul Metsers, Dave Hollis, Chris Thompson, Mark Laurent, Kath Tait, Lorina Harding, Mahinarangi Tocker and many many more. Seeing and hearing the amazing singing and harmonies of the Ink Spots was also a performance to remember. Best backstage or performance anecdote? I do remember a Maidment Theatre concert where Peter Charlton Jones started a great blues song when Brendan Power came onto the stage and launched into a blistering solo, not realising Peter had the capo on the wrong fret. After the laughter had stopped the crowd had loosened up and it made for a great night. How do you view the current recording industry landscape for both artists and live venues? Sad to see so many record shops disappearing, but the best ones seem to be doing okay. Though my CDs are available online, it is only good for promotion, as almost no money makes it back to me. The idea of having a booklet with newspaper clippings and photos seems to help me sell a lot more through Marbecks and at gigs. I was also very lucky to have a patron for my latest CD who liked the project and wanted to help get it out to a wider audience. Radio NZ is also producing a series with Peter Elliot reading the news clips followed by the songs and I even got paid for it! One does have to come up with new ideas to get your music out to a wider audience but the upside is more and more artists are doing live gigs, as it is the best way to sell CDs. What’s the most important thing you would pass on to a young musician intent on a career as a professional musician? Stay positive and enjoy making your music and keep creating and exploring. Name five favourite records that never fail to brighten your day? What’s the best book about music that youve read? Straight Life by Art Pepper, or, for a bit of Kiwi musical history (pre pop), Faces in the Firelight by Phil Garland. How do you define success? The best advice you ever got was…? Frank Winter told me to stop singing to myself. SING OUT! Or no one will hear what you have to say.